This morning everybody was at home opening their presents and enjoying the company of their families. The afternoon however the town was full of children trying our their brand new toys, bikes with some of the wrapping still on them, shiny scooters and never-before-used skateboards were whizzing past us. I wasn't an exception either as I was slowly going up and down next to a handrail by the river on my new rollerblades. 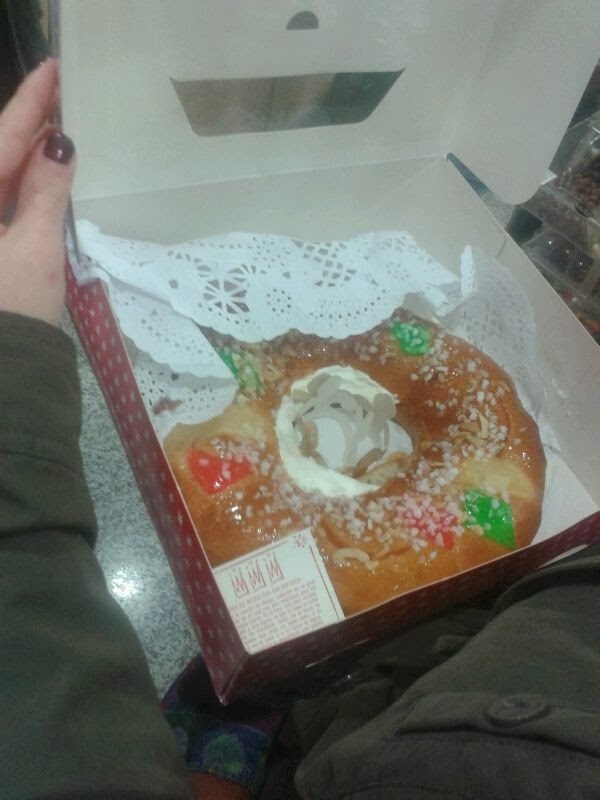 In many homes at this time of the year people prepare and eat a special Christmas cake called 'el Roscón del Reyes', which means ´twisted roll of kings´. This is a loaf shaped like a crown (which basically mean it´s a circle) which is decorated with sweets and jellies on top. This colourful decoration represents the jewels on the kings´ crowns. The cake has two things hidden in it. One is a lucky charm and the person who finds it can bank on a lot of luck for that year (which, added to the luck coming from the 12 grapes seems quite substantial) and can put on the crown that comes in the box with the cake. The other thing is a bean. If you find this then not only you´re unlucky but you also have to pay for the cake! In the last few days the shops have been full of huge boxes of Roscón cakes piled on top of each other. In the cafés as a seasonal offer instead of ´coffee and cake´ you can buy ´cafe y roscón´. You can find a roscón recipe here.